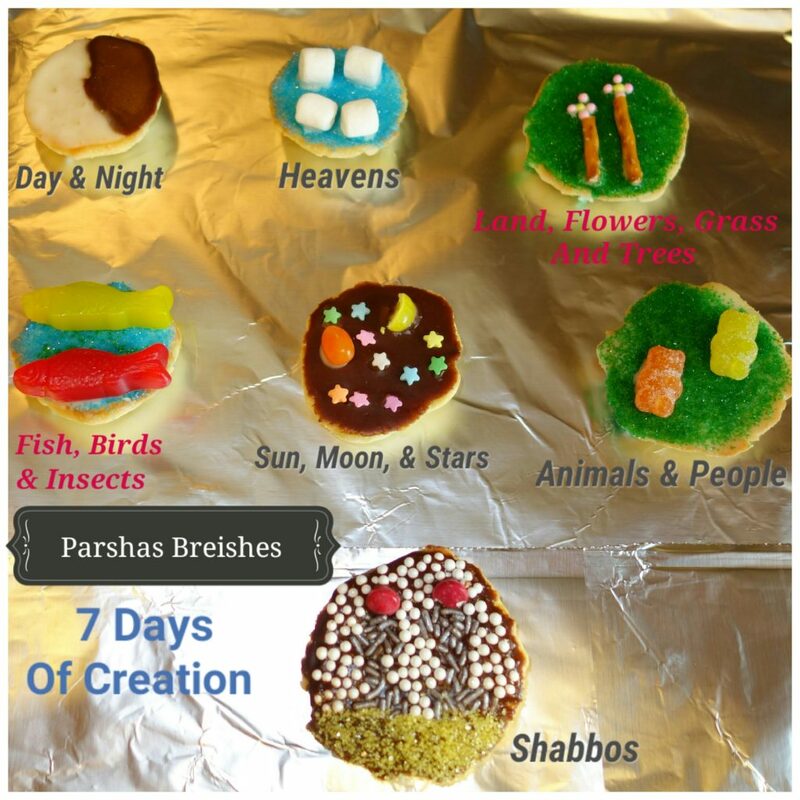 In this weeks Parsha it discusses the days of creation. On the first day Hashem created light and dark. On the second day Hashem seperated the Heaven and Earth. On the third day Hashem created the land, flowers, grass and Trees. On the fourth day Hashem created fish birds and insects. On the fifth day Hashem created the sun, moon and stars. On the sixth day Hashem created animals and people. On the seventh day Hashem rested and we have Shabbos. For this weeks Parsha I made Days of Creation Cookies. I used the Spice and Spirit recipe for black and white cookies to make the cookies. For the First day I made a black and white cookie to show the light and dark. For the Second day I used just the white icing on the cookie and then sprinkles on some blue sugar crystals for the sky and used mini marshmallows for the clouds. For the Third day I used the white icing again and sprinkled on some green sugar crystals for the grass, pretzel sticks for the trees and some pink and yellow nonpareil sprinkles to make the flowers. For the Fourth day I used the white icing again and sprinkled on some blue sugar crystals for the water and stuck on some jelly fish for the fish. For the Fifth day I used the chocolate icing and sprinkled on some flower confetti sprinkles as stars, I cut a yellow jelly bean in half for the moon, I used a orange jelly bean for the sun. For the Sixth day I used white icing and sprinkled on some green sugar crystals for the grass and put on some gummy bears for the animals. For the Seventh day I used chocolate icing and sprinkled on silver sprinkles in the shape of candle sticks. I used red candy coated chocolate for the flames. I used gold sugar crystals as the tray for the candles. I used white nonpareil sprinkles to fill up the background of the candle sticks. 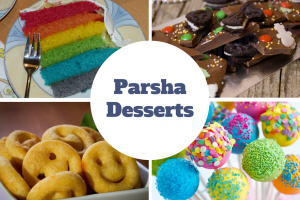 I started doing Parsha Desserts in 2014 when I saw Esther Lejbovitz post about rainbow cookies for Parshas Noach. 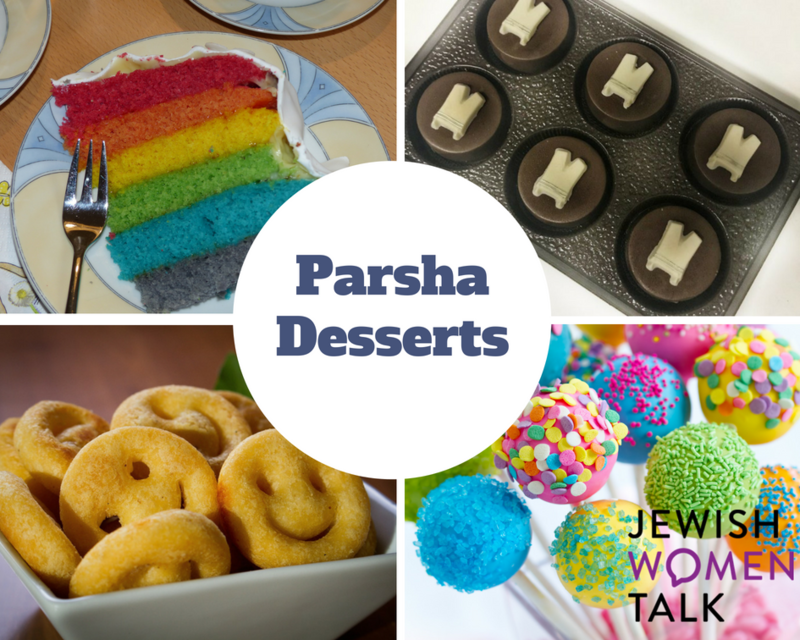 I loved the idea of doing Parsha Desserts so I continued making some more. 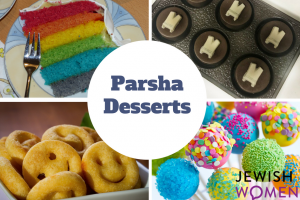 This year I'm excited to start again since my kids are in school and learning about the Parsha.